There were already weird things connected to the highest point in Grand Theft Auto V's sprawling fake Los Angeles. Secret messages. Instructional glyphs on an enigmatic mural. UFOs that appear only under certain conditions. Off-kilter stuff for a gritty, mostly down-to-earth game like GTA V. But, with release of new-gen versions of Rockstar's hit, the Mt. Chiliad mystery seems to be mutating in even stranger ways. The Chiliad Mystery is the name given to the bizarre, unexplained discoverables seeded throughout GTA V. Ever since the first iteration of the game came out last year, a dedicated core of players on Reddit and fan sites has been scouring GTA V for clues and secrets that might tie the weirdness into some kind of logical sense. What's the weirdness exactly? Scattered all over Los Santos are drawings and writing focused on unidentified flying objects. The Chiliad hunters have crowd-sourced enough knowledge to spot these old-school-style spaceships at specific times and circumstances. These phenomena only appear to players who've completed GTA V 100%, meaning they've done every possible side mission in Rockstar's stuffed-to-the-gills game. The collective thinking is that the UFOs—some solid, one not—might just be pointing to something bigger, another vein of veiled content that will wind up making this fringe part of the GTA-verse even more strange. Or the mystery might reveal connections between V and its west-coast predecessor Grand Theft Auto: San Andreas, which also had a thread of UFO conspiracy theory elements running through it. Or there might be a jetpack lurking somewhere in GTA V, like there was in San Andreas. There used to be a face on the side of the weirdness-magnet mountain. Now there's another body part—or farm animal—where that used to be. 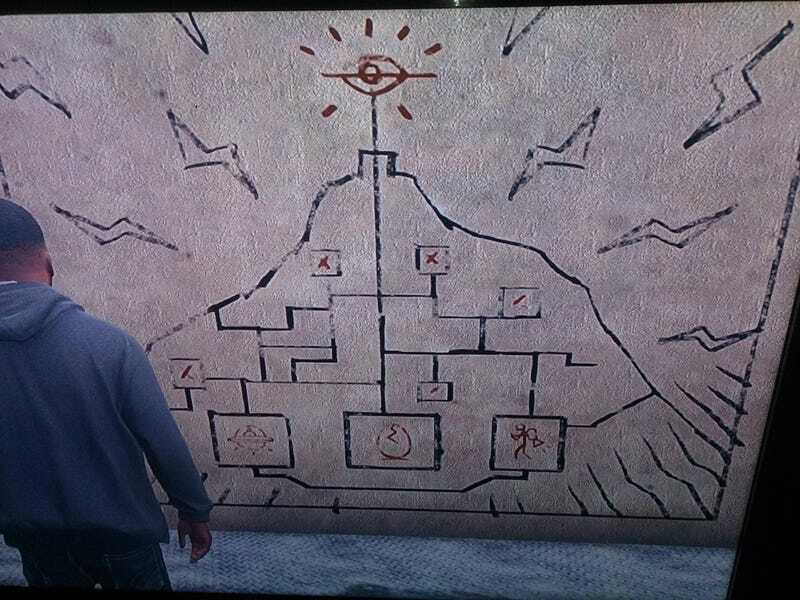 The all-seeing eye that's part of the Chiliad lore? It was previously seen on some of the glyphs on Mt. Chiliad and on the t-shirt of conspiracy-happy hippy Omega. Trevor now has a small tattoo on his hand that seemingly invokes it. Now that the higher-resolution textures in the PS4 and Xbox One of GTA V make background imagery more readable, people are scanning the minute details in heist planner Lester's house in the hopes that more clues will be found there. Video below from the LaroseTV: Game! YouTube channel. The character seems to be a bit of a ET fanatic himself. With the release of GTA V for PS4 and Xbox One, the collective hope is that some sort of answer to the Chiliad mystery will start to coalesce as players grind to 100% completion. Of course, all of the supposed pieces to the Chiliad mystery might just be weird, disconnected jokes that aren't meant to be connected together at all. And there's also the possibility that any true answer might not come until the PC release of GTA V, which is still months away. But, for now, the Chiliad hunters continue to want to believe. Every new change to the features of Mt. Chiliad and the world of GTA V gives them hope that their belief might not be in vain.